A friend and I recently formed a very small [read: 2-member] book club. Our first discussion was The 25,000 Mile Love Story, in which Swiss long-distance runner Serge Roetheli tells his story of growing up in the Swiss Alps, training to as an Olympic Boxer, becoming a mountain guide, and eventually running more than 25,000 miles on 6 different continents with his then-wife Nicole by his side on a motorcycle. My fellow bookworm, Megan, who has run several marathons, chose this book because the author says he did this crazy feat in order to raise money for impoverished children. We both wanted to be inspired by someone who struck out on an amazing adventure, but the combination of philanthropy and endurance made this book seem even more promising. 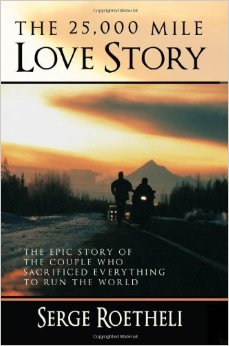 While Love Story did deliver on the endurance end-- it contains vignettes of the husband and wife suffering through harsh weather conditions, culture shock, dangerous territory, accidents, snake bites and cerebral malaria-- Roetheli's philanthropic claims seemed disingenuous. At the end of the book, both Megan and I felt that Roetheli was using charitable causes as an excuse for his own personal adventure. He complains that the Swiss charity that originally sponsored his World Tour "Run for Kids," pulled out inexplicably, leaving them without the money to continue. To me, this seemed a little backwards. Was he supposed to be running to raise awareness (and ideally, funds) for impoverished children? Shouldn't he be giving money to the charity rather than depending on the charity to fund his round-the-world adventure? Actually, there was very little in the book referring to whatever charitable works the author and his wife had contributed to on their journey. They did take a brief hiatus in the World Tour to help an eye doctor administer vision-saving surgeries in Costa Rica. The doctor, Dr. Zamber, more than repaid them for their good deed, by footing their travel bill after the initial Swiss charity pulled out. The tour title "Run for Kids" is equally problematic, even if the tour is geared toward raising awareness more than raising money or actually serving people in need. Roetheli's scant mention of kids were those he and Nicole met in a Middle Eastern juvenile prison, where the only connection he made was with a boy who was serving a life sentence for murdering his own father. There was no information on how to help these troubled teens. There was no mention throughout the book of specific charities or organizations that help at-risk teens or destitute children. Raising awareness involves telling stories of these children and shining light on the ways readers can help them. The book also emphasized how much Serge and Nicole sacrificed to pursue their dream, including years away from Serge's two children from his first marriage. A scene from the book captures Serge's supposed sacrifice. Camping near the base of Mt. Sinai, Serge smoked his pipe and mused, "My daughter, Clara, turned sixteen that day. I sent up a wish for her and was reminded, once again, that there is a price we pay for our dreams. I missed my children dearly"(143). Yet, out of the book's 200 pages, this brief paragraph was the only time the author even mentions his children. I wasn't convinced that he was really the one paying the price. Megan's insight was that Serge could have written this book more honestly, by being upfront about his intention to find a way to run the world and be known as an amazing endurance athlete. There is no doubt that Roetheli deserves praise and awe for his strength and survival skills. And his then-wife also deserves praise for sticking with him through the tour! But the author's decision to fund his travels by repackaging his run as a philanthropic endeavor cheapened the entire story. In the end, Roetheli came off as self-centered, self-important and self-absorbed. Both Megan and I wanted to like this book, but in the end it seemed like the author's ulterior motive of making a name for himself got in the way of making this either an epic or a love story.